It is so nice to finally ease back into the swing of things! I have several upcoming posts planned, sharing some of the (many!) DIY’s I did for my wedding. I promise these are not all wedding specific, and will work beautifully for any other event or party, or just as well for your home or room decor. You can save any glass container that you bring into your home, anything from jam jars, to syrup bottles and tomato sauce jars / bottles. You can also find these in thrift stores or garage sales, and they are normally very affordable- I picked up a whole bunch for $0.20 each! Make sure your container is clean and dry, and doesn’t have any glue residue from labels. One trick I learned from my sister to clean up sticky leftover glue is to use a dish detergent tablet and scrub with a bit of water- it dissolves the glue, and provides abrasion to scrape it away. If your container has a “best before” date stamp on it, use rubbing alcohol or nail polish remover on a cotton pad to easily remove it. 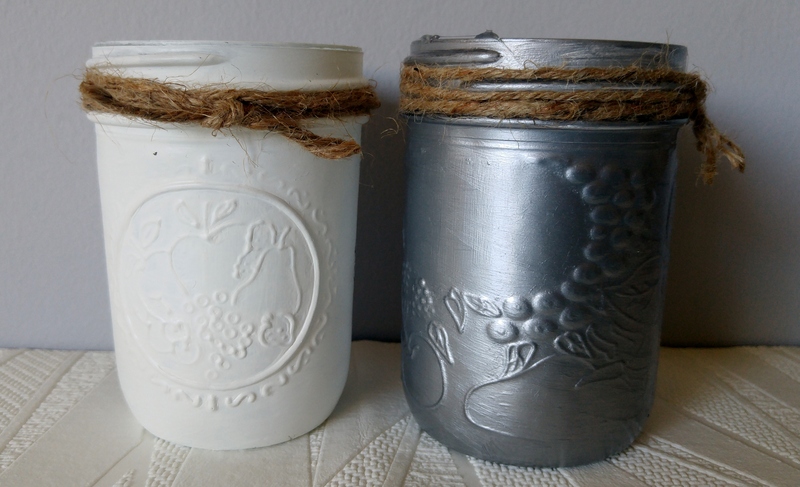 Wide-mouth jars: Use a paint brush to paint the inside of the jar. Depending on your paint, multiple coats may be required to achieve desired level of opacity. Leave jars upright to dry between coats. Narrow-mouth bottles: Pour a small amount of paint into the jar, and swirl and spin your bottle so that the paint evenly coats the inside. This works best with less viscous paints, so you may need to dilute if the paint you are using is too thick. Turn bottle upside down to drain out remaining paint. Leave bottle upside down on a newspaper to continue to drain as it dries, and move it to a clean spot every few minutes. Pros: Glass exterior retains its durable and glossy finish, highlighting any design elements in your jar like raised decorative bumps. Minimal brush strokes are visible. Cons: pretty time consuming, especially when multiple coats are needed. May not be waterproof, if you are planning to use your container for real flowers in water. Same kind of paints work well here, the more opaque the better! This method works regardless of the shape of your container. Simply use a paintbrush to cover the outside of your glass container with thin coats of paint, being mindful of the direction of your brush strokes. To minimize the look of brush strokes, alternate direction with each new coat of paint. Pros: Super easy! Allows you to choose the finish, depending on the paint you use- matte, chalky, textured, glossy, even sparkly! Cons: In most cases multiple coats are needed. Visible brush strokes. Depending on the type of paint, may rub off easily if not sealed with a top coat. 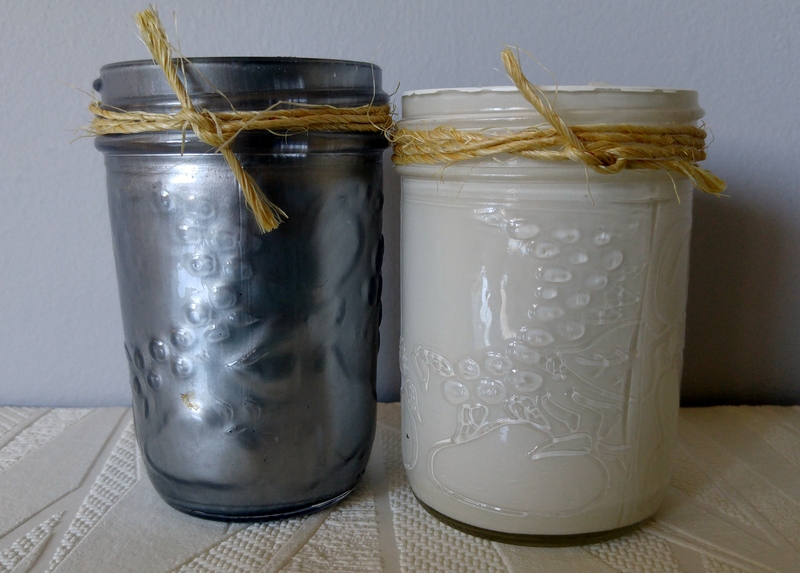 This was the first method that came to my mind when I thought about painting glass jars and bottles. Unfortunately, since we live in an apartment with no balcony, I had to find an alternative outdoor space to test out this method! 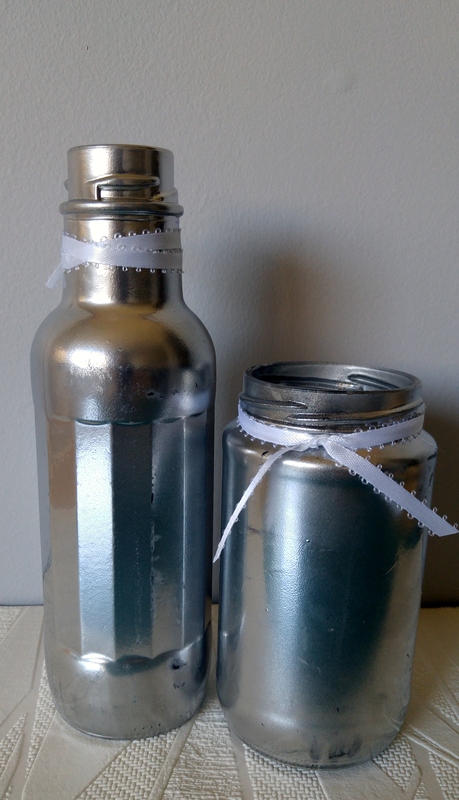 I do feel that my spray painting skills (or lack thereof) affected the outcome here, so I would definitely recommend having a “practice” piece first, before painting the rest of your jars or bottles. Follow the steps on your can of spray paint- they are not joking when they say to use multiple thin even coats! Otherwise you get drips and bumps- not good! Pros: By far the quickest method. Huge variety of colors and finishes available. Cons: Skill dependent. Need outdoor space. May rub off easily if not sealed. 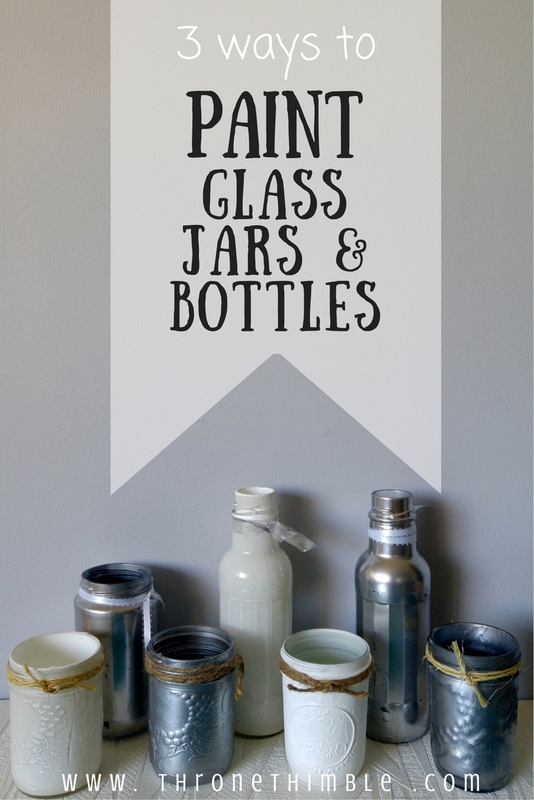 I hope you try these techniques with any jar or bottle you may have laying around! If you do, make sure to share and tag me on Instagarm @throneandthimble so that I can see! This blog is really cool. I have bookmarked it. Do you allow guest posting on your blog ? I can provide high quality posts for you.